Imagine William Faulkner’s The Sound and the Fury crossed with It’s Always Sunny in Philidelphia and you have something close to Suttree. One main character is a brooding rebel who has rejected his family’s wealth and lives on a river catching fish, spending his time drinking heavily and living painfully. Another fucks watermelons. This is an outrageous and astounding novel. Seemingly aimless, true, but if you stick with it you’ll love how it can both amuse and devastate you. The writing is great, but McCarthy has most stunning prose of anyone alive so that can be taken for granted with him at this point. I tend to keep a few simple notes while I’m reading a novel so I can keep track of moments or themes that strike me as particularly important or interesting. Despite the fact that, as mentioned above, Suttree is essentially plot-less, I had almost three times as much written when finishing than I normally do. Part of that is probably length, as this is a hefty book, but this also speaks to just how rich in detail and subtext it is. You could re-read each page and find a fascinating detail you missed the first time round. With a great mixture of the profound and the hilariously crude, this was a fitting and satisfying book for me to finish my reading of McCarthy on. Still, it didn’t fully hook me until quite late in the story. I needed to get used to the strange, drifting narrative. 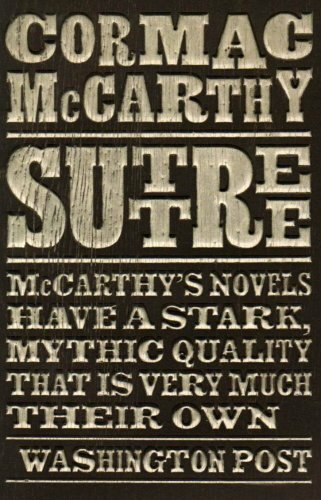 Let Suttree wash over you like cold water: adjust, be patient. You’ll be rewarded. There’s something great lurking beneath the murky surface.